This is 50/50 a real post and a service announcement. 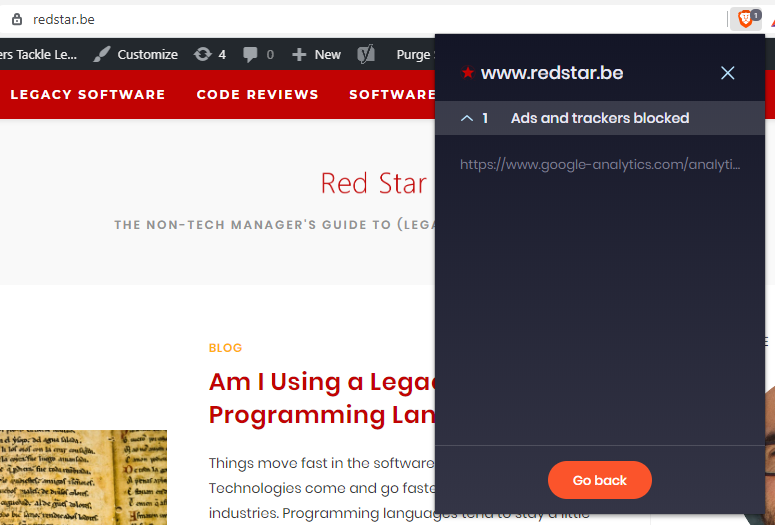 The short version is that I’ve removed Google Analytics from this site (and redstar.be, my legacy project blog for non-technical people). I’m also using Brave and DuckDuckGo now. Read on for the long version. From Wikimedia Commons, licensed under the BSD license. But by using Chrome, we send over some data about us. Among other, Google receives the things we search for. Google has many more ways of collecting data: it’s search engine, Gmail, Google Analytics, etc. So this may just be a drop in the ocean, but I started looking for alternatives to Chrome. I tried the new Firefox for some time, but it just didn’t work for me. I’m probably already too much hooked into the UI and UX of Google Chrome. But then I found Brave. It’s based on Chromium, Chrome’s open source base. It has the same look and feel like Chrome, and all my extension work out of the box. This is of course a video made by Brave, but it feels right in my experience. Now when websites ask me if I’m OK with cookies and stuff, I say fine, and my browser will block them anyway. However, Google Analytics isn’t doing much that I need and can’t find elsewhere. I use it mainly to see the evolution of site visitors. Sometimes, I check how the visitors came to my site. I’m using WordPress, which has the excellent WP Statistics plugin. This gives me everything I need, without sending any data to other parties. A final step I’ve made is to start using DuckDuckGo as a search engine. DuckDuckGo is a search engine that doesn’t track you while you surf the web. Nor does it save your search queries. It’s a search engine focussed on privacy. I’m testing to see if it can replace Google for me, because Google still is the best search engine. I’ve tried Bing in the past, but it’s too US-centric for me (living in Belgium). So far, it has been working well, though the maps (based on Apple maps) is not up to par. Now that we’re seeing a consciousness about privacy slowly emerging, people start looking for alternatives. They are definitely out there, and they’re getting better. I won’t put on a tinfoil hat and become paranoid, but it can’t hurt to reduce the amount of personal data I’m sharing with a handful of large companies. With Brave as a browser, and DuckDuckGo as a search engine, I’ve taken a first few steps. And to be consistent, I’ve at least turned of third party cookies on my own sites.